Raise your hand if you enjoy comedy. I’m sure if this was a class everyone would have their hand up. 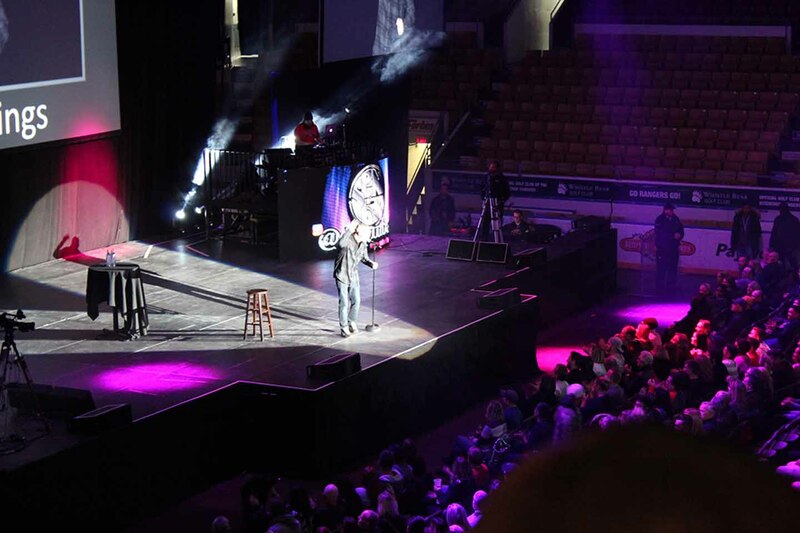 On Nov. 19, Russell Peters returned to his hometown of Kitchener and had the crowd howling with laughter. The show opened up with some jokes from comedian Jason Collings. I am not a parent but his jokes about his 20-something year old sons, or citizens as he called them, had me gasping for air – at the rate we were laughing, I wish laughter had given us abs instead of leaving us struggling for air. Other topics he entertained the crowd with included jokes about airports which most of us can relate to. One of the punchlines of his jokes was “If you cant carry it, it ain’t carry on,” and I think we all know some people who could use this advice. After twenty minutes, Jason had to leave us and Russell Peters himself came into the room. The crowd went ballistic as soon as they heard his voice. Russell’s performance consisted of relatable jokes on topics such as weight, the cost of doctors appointments ( we live in Canada so I couldn’t relate to that), and he took time to point out some people in the audience and exchange some banter with them. I would be lying if I said that during some point in the show I considered leaving university altogether and became a comedian myself. Unfortunately, I’m only funny for about 2 minutes in a given year so I had to let that idea go. However, it was a great stress reliever from the struggles of midterms and never ending assignments.